Life drawing is a constant state of discovery and immediacy as we learn to see and feel the human form from a drawing perspective. Artist and tutor Christine Simpson will take you on a journey to explore the landscape of the human figure. We will consider in different sessions rhythm; form; depth; gravity; the power of the line; tonal shapes and relationships; emotional sensations; shadow-play; and the building blocks of anatomy. 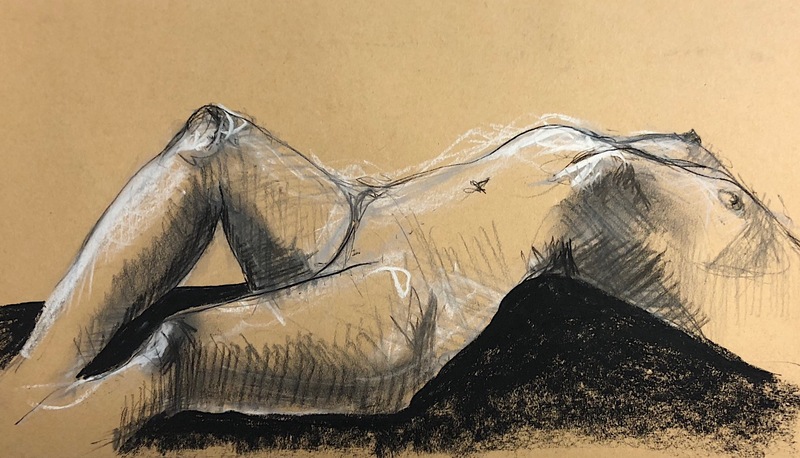 In these life drawing sessions we are involved in the act of seeing both the energy and construction of the human form to render a sense of what is, rather then slavishly trying to get there by copying. We are endeavouring to see creatively and not to use the thinking brain to analyse and objectify. Each term we look at a different master drawer for inspiration into different ways of seeing. Places available for a 5 week half term or casual attendance, numbers attending vary each week, bookings essential. 10% discount for art supplies at The Art Shop at Mona Vale if you tell them you are a participant.